We could almost see the smirks on the Congressional Republican faces as they received the news that the U.S. Supreme Court deadlocked 4-4 on President Obama’s Immigration relief plan. It is unfathomable that the nation’s elected “leadership” should react with such cruelty to an issue so important to millions of our country. A large number of these so-called “illegal immigrants” are people from Mexico who risked everything to crash our border and seek a better life for themselves and their families. It is the immigrants who hold the jobs that most “legal” Americans refuse to do. They hoe farm fields in the hot summer heat. They clean homes of the rich and famous. They sweep floors in public buildings; clean motel rooms and work dirty jobs wherever they can find them, usually for minimum or even less than minimum wages, just for a chance to be a U.S. citizen. Worst of all, the workers have no chance for Social Security retirement or other worker benefits if they remain in illegal status without a green card. 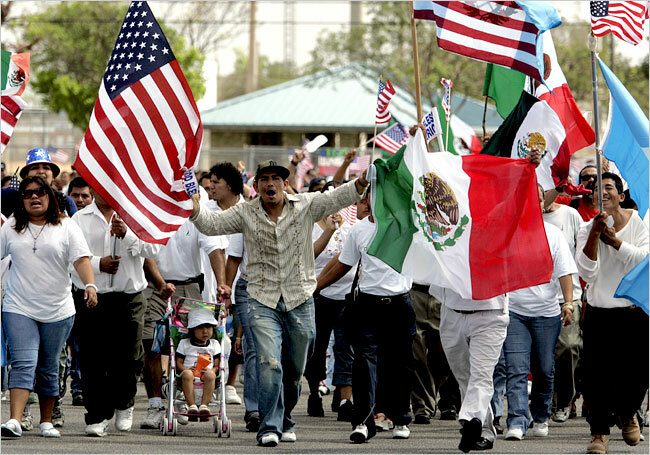 As times get harder and harder for the rest of us; as we are stressed from rising costs, low wages and job uncertainty, and as we watch the political turmoil unfolding in Washington and in the states in which we live, it should not be hard for most Americans to put themselves in the shoes of the so-called “Mexican illegals.” The day may come when we may consider fleeing to another country ourselves in search for a better way of life. There is perhaps irony in that most of the Mexican immigrants that have crossed the border are living in the Southwest Territory that once was part of Mexico. We took the land from them, claiming it to be part of the United States, through warfare. The fact that we claim a border separates our two countries is only true in a legal sense. The land is the same on both sides of that invisible line. There is a story floating around that many of the Mexican people who came to the U.S. are now crossing the border to get back to Mexico where they think life might be better for them after all. It is true that a lot of good American jobs have been moved from the U.S. into Mexico, so jobs are getting more and more available. Mr. Obama’s proposed plan would allow illegal immigrants that meet certain categories to remain in the country and apply for work permits. They qualify if they have been in the U.S. for at least five years and have not committed felonies or repeated misdemeanors. The plan also protected people brought into the U. S. as children. The 4-4 split vote on the high court kicks the issue back into the Texas Court of Appeals that ruled 2-1 that the federal immigration laws cannot be changed without approval by Congress. And a Congress dominated by Republicans has made it clear that it will never approve anything Mr. Obama, the nation’s first black president, wants to accomplish. For example, if the Republicans had approved Judge Merrick Garland, Mr. Obama’s nominee for the Scalia vacancy on the Supreme Court, Garland would have been able to break the tie. The president said it will be up to the voters to decide the fate of the millions of migrant workers now living in the country. Candidate Trump says he will deport them all and build a wall to keep any more Mexican people from getting in. Hillary Clinton says she supports Obama’s plan. They appear to be the two leading party candidates at this time.